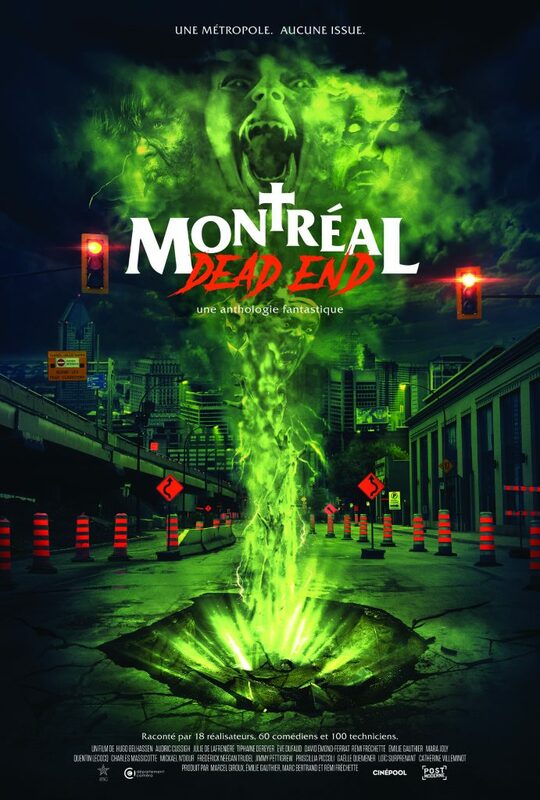 MONTRÉAL DEAD END is an ambitious anthology feature that might have aimed to put Montreal on the horror map as a hotbed of filmmaking talent, but is so parochially focused it’s unlikely viewers outside the city will get much out of it. At least the mayor will be happy that the movie’s limited appeal will keep Montreal’s horrific pothole problem a secret from the world a little bit longer. The wraparound conceit that Montreal’s many potholes lead to a font of green ectoplasmic energy that is the source of all manner of demonic weirdness is a cute if unoriginal setup. If that was the only example of lifted inspiration here, it might have been OK, but when the first segment goes on to steal THE EVIL DEAD’s famous low-angle POV shot, complete with similar sound effects and possessed tree branches, any self-respecting genre devotee hoping for more than just fan fiction writ large will realize they’re in for a very long and derivative 85 minutes. There are zombies, ghosts, zombies, a werewolf, zombies, evil kids, zombies, cults, zombies, warlocks, zombies and some possessed fruit. Yes, they even find a way to knock off ATTACK OF THE KILLER TOMATOES. I guess when you’ve got 18 individual shorts to cram in, you end up cribbing from the bottom of the barrel. Did I mention there are zombies? That said, there’s a certain joie de vivre to the segments that comes through despite the unoriginality, and anyone living in or familiar with the city could do worse than seeing MONTRÉAL DEAD END with an audience of locals—like those at the Fantasia International Film Festival premiere, who loved the movie so much they gave it a standing ovation. One hopes that instead of going for the obvious sequel set up in the finale, Kino and the individual filmmakers instead show us their original visions and tell stories that aspire to do more than merely elicit guffaws of hometown recognition.